I liked the novel. Noah and Josie are a really great couple and it was a joy reading about them 5 years later from the prequel. There was a really great and heartwarming plot line in the girl who came back to her hometown and rekindles a spark with her love, it had excitement and mystery and a shocker of a twist, steamy romance, and amazing secondary characters that I really want to make me read their stories. 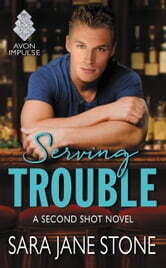 I am happy with this HEA and hope they continue through the next books so I can see how they are doing. This is book # 1 in the Second Shot series. (There is a prequel so this is technically book # 2) They should be read in order. This will give the reader the background and understanding to make the books more enjoyable. Noah and Josie go way back. He is her brother's best friend. This makes her unreachable and a relationship they might have taboo. Her brother does not want her to have feelings for him. Too late. Josie has been in love with Noah almost from the beginning. They got one special night together before he went away to boot camp. Now, years later, it is awkward between them. Josie needs a job, though, and she is sticking to her guns. Such a sweet and powerful story! A real page turner. I was absorbing each page and could not wait to finish. The character development is right on and the pace is just quick enough to make you second guess. ***This ARC copy was given in exchange for an honest review.